A sad ending to a $1-million-dollar car. While Rowan Atkinson might be best known to Americans as the rubbery-faced Mr. Bean (or the delightfully sarcastic Blackadder if you watched as much PBS as I did), he’s also known for another thing in his native country of England. Rowan Atkinson is a speed demon. He’s a celebrity with a love of fast cars, as shown by the fact that he owns a McLaren F1, one of the fastest production cars ever made, and has the fastest celebrity lap on Top Gear. It is believed Atkinson’s love of speed has gotten him in a bit of a scrape. 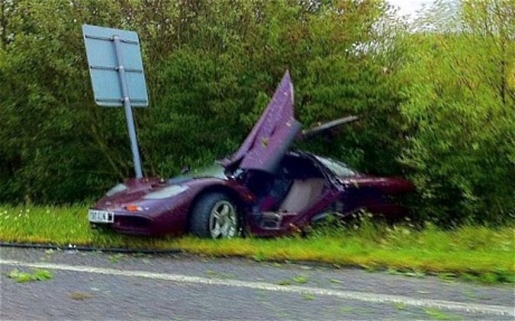 Rowan Atkinson wrecked his $1.05 million-dollar McLaren F1 near Haddon, Cambridgeshire. Fortunately, it is believed that the 56-year-old Atkinson wasn’t doing 231 miles an hour at the time of the crash, which is why he was transported to Peterborough District Hospital with only a shoulder injury rather than turned into paste upon collision. Despite being sent to the hospital, the shaken-up Atkinson was able to walk away from the wreck, though passing motorists on the A605 stopped to render assistance to the beloved comedy star. Atkinson is expected to be released today.